1. A man is facing west. 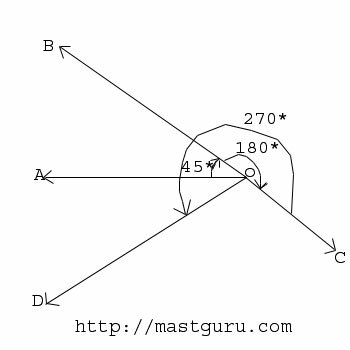 He turns 45 degree in the clockwise direction and then another 180 degree in the same direction and then 270 degree in the anticlockwise direction. Find which direction he is facing now ? Please refer to the explanation image. The man firstly faces the direction OA. On moving 45 degree clockwise[Please check carefully always if clockwise or anticlockwise], he faces the direction OB. Now again he moved 180 degree clockwise, now he will be facing OC. From here he moved 270 degree anticlockwise, Finally he is facing OD, which is South west. 2. A man is facing north. He turns 45 degree in the clockwise direction and then another 180 degree in the same direction and then 45 degree in the anticlockwise direction. Find which direction he is facing now ? The man firstly faces the direction OA. On moving 45 degree clockwise, he faces the direction OB. Now again he moved 180 degree clockwise, now he will be facing OC. From here he moved 45 degree anticlockwise, Finally he is facing OD, which is South direction. 3. One day, Raviraj left home and cycled 20 Km southwards, turned right and cycled 10 km and turned right and cycled 20 Km and turned left and cycled 20 Km. How many kilometres will he have to cycle to reach his home straight ? Raviraj starts from home at A, moves 20 Km in south upto B. Then he turns right and moves 10 Km upto C, then he turns right and moves 20 Km upto D, then he turns lefts and moves 20 Km upto E.
4. A child is looking for his father. He went 90 meters in the east before turning to his right. He went 20 meters before turning to is right again to look for his father at his uncle's place 30 meters from this point. His father was not there. From there, he went 100 meters to his north before meeting his father in a street. How far did the son meet his father from starting point ? 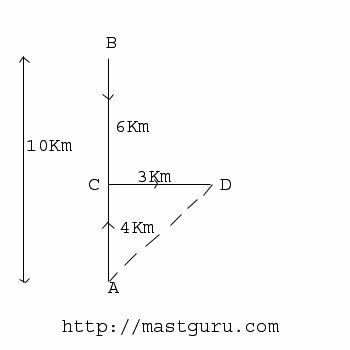 Clearly, the child moves from A to B 90 metres eastwards upto B, then turns right and moves 20 metre upto C, then turns right and moves upto 30 metre upto D. Finally he turns right and moves upto 100 metre upto E.
So from starting point his father was 100 metre away. 5. Kunal walks 10 km towards North. From there he walks 6 Km towards South. Then, he walks 3 Km towards east. 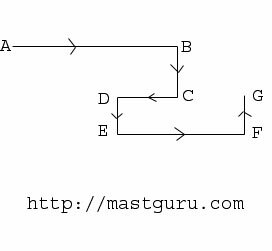 How far and in which direction is he with reference to his starting point ? Clearly, Kunal moves from A 10 Km northwards upto B, then moves 6 Km southwards upto C, turns towards east and moves 3 km upto D.
So AD is 5 Km also with reference to starting point Kunal's direction is North-East. 6. Gaurav walks 20 metres towards North. He then turns left and walks 40 metres. He again turns left and walks 20 metres. Further, he moves 20 metres after turning to the right. How far is he from his original position ? 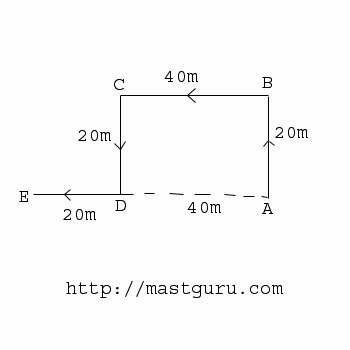 Please check the movements of Gaurav in the figure. AE = (AD+DE) = 40 + 20 = 60 metres. 7. A dog runs 20 metre towards East and turns Right, runs 10 metre and turns to right, runs 9 metre and again turns to left, runs 5 metre and then turns to left, runs 12 metre and finally turns to left and runs 6 metre. Now which direction dog is facing ? Now dog is facing North. Mr.dandge starts jogging from his home to the near by park. He jogs 7 m towards east then jogs 9m to his left. He then jogs 6 m to his right & then jogs 11 m towards north. He then jogs 13 m towards west. How far is he from the starting point? A man went 15 m to the north, then turned west and covered 10 m, then turned south and covered 5 m and then turned east and covered 10 m. In which direction was the man from the house? 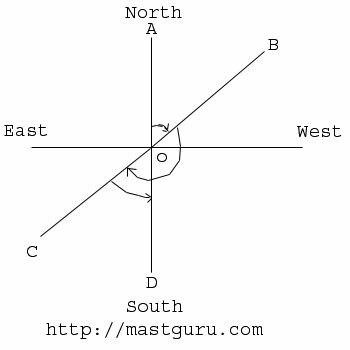 East or West or North or South? Four branches of a company are located at M,N,O, and P. M is north of N at a distance of 4km; P is south of O at a distance of 2km; N is southeast of O by 1km. 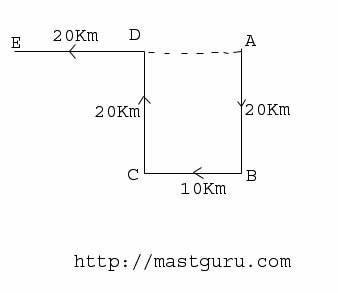 What is the distance between M and P in km? Give me the ans with explanation. A hunter took his rifle to hunt down a deer...now first he tracked down the deer by moving 10 kms towards the north direction...then missing his target he again moved 10 kms in the south direction...now he managed to kil the deer..and thus he walked 10 kms towards the east to get back to the place where he started....now the question is ...what kind of deer did he kill???? A man travels 6 km in the north and turns to its right and covers the distance of 3 km and again he turns right and covers 5 km, how much he is far from hi starting point? if a man is walkin towards east and takes 45 dgres left and then takes 90 dgres right. in which direction is he now? A man walks 1 km towards East and then he turns South and walks 5 km. Again he turns East and walks 2 km, after this he turns North and walks 9 km. Now, how far is he from his starting point? Now man will be 5 km from the starting point. 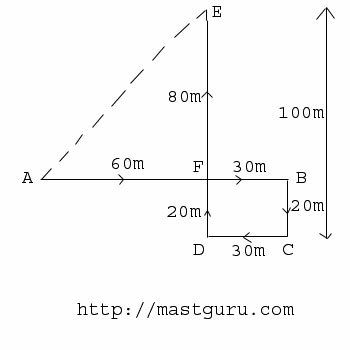 If you will draw a figure as per question, you will find the base will be 3km and Height will be 4 km, So by applying pythagoras theorem you can get result as squareroot of (9+16) = 5 km.